A Library in Your Loft? Posted March 22, 2017 by jordannet66 & filed under Blog. Many people opt for loft conversions as a way of adding space to their home. They could be a most helpful way of shifting clutter from your living room or bedrooms. If you prefer to have a minimalist living room, the last thing you want are shelves and nick-nacks cluttering your lounge. What if you’re a book lover who cannot move for your personal library? Turning your newly converted loft into a library and study room could solve that problem for you. If you need a quiet study space for exam revision or somewhere to chill, away from the hustle and bustle, why not expand upwards instead of outwards? Away from the television or the video games console, a second or third floor in your home allows for that much-needed quiet space in the home. 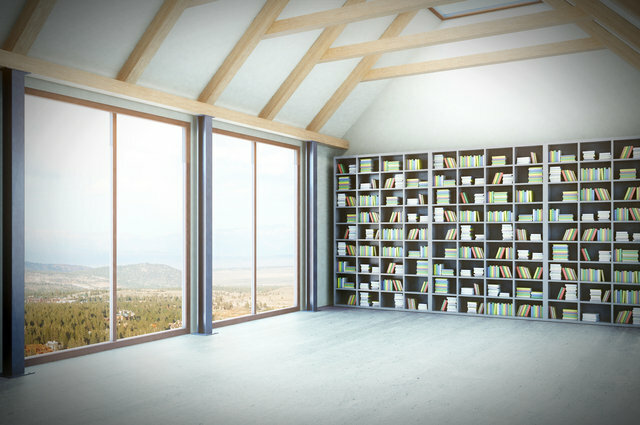 Your bibliophile’s paradise could have shelves up to the apex of your roof. Full height shelves could give you more space for your desk. Maybe a cosy chair or two with a coffee table. With maximum headroom in mind, consider placing the desk towards the highest point of your roof. For example, in line with the apex towards the gable. Lower parts of the roof could be used for storing low height shelves and radiators. To protect your books, your rooflights should be adjacent to, rather than opposite your bookshelves. If you’re looking for inspiration, Pinterest is a good source for creating your dream loft conversion. The House Beautiful website is another good source. If you’re creative enough with a flair for illustration, why not sketch a few ideas? You could share them with us if you’ve asked for a free no-obligation quote via a telephone call or email message. Up Another Level, 22 March 2017. Home » Blog » Blog » A Library in Your Loft?